On Camera, it has triple rear cameras, 16MP 107-degree super wide-angle, 12MP standard angle and 12MP telephoto with 2x optical zoom (or 3.2x the zoom of the wide-angle lens). The Triple Shot feature stitches together the images captured with each of the three lenses into a short video file for easy sharing. On the front, there is a 5MP wide-angle lens and 8MP standard camera for bokeh effect with an on-screen slider to adjust the amount of background blur. It has Dual PDAF (Phase Detection Auto Focus) for automatic focusing that is 50% faster, advanced HDR feature analyzes and determines the right exposure settings to create perfectly lit shots, AI Auto White Balance (AI AWB), AI Shutter selects the right shutter speed, especially useful when trying to capture fast-moving subjects, Cine Shot, 3D Light Effect, Makeup Pro, Custom Backdrop, My Avatar and AR Emoji. 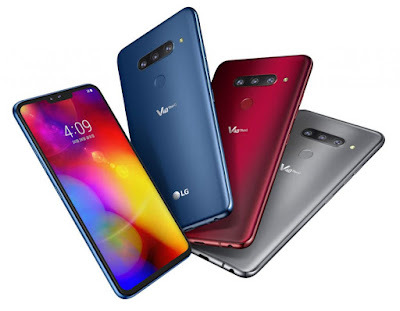 LG V40 ThinQ has 3.5mm audio jack with 32-bit Hi-Fi Quad DAC and Boombox Speaker.It uses Silky Blast process that etches the tempered glass back with microscopic pits to create a smoother matte finish so it is not slippery when holding and is also resistant to fingerprints and stains. It has MIL-STD 810G military-grade durability and is IP68 rated for dust and water resistance. It has a fingerprint sensor on the back Packed by a 3300mAh battery with support for fast charging and wireless charging. LG V40 ThinQ comes in New Aurora Black, New Platinum Gray, New Moroccan Blue and Carmine Red colors. It is available from Verizon USA starting at $40.83 a month for 24 months or $979.99 in retail from October 18. T-Mobile offers it for $200 down and $30 a month for 24 months (FRP: $920 (Rs. 67,980 approx.)) from October 19th and Sprint is offering it at $20 per month plan that comes to around $960 (Rs. 70,940 approx. ), starting October 19th. Pre-orders get DJI Osmo Mobile 2 gimbal and SanDisk Ultra 256GB microSD card.